Looking for the Best Pop-Up Tent? Out of our top picks, we recommend the Coleman Sundome 4-Person Tent as the best pop-up tent for an easy camping experience. Setup is simple thanks to continuous pole sleeves so it only requires you to feed the poles one time. It should take you around 15 minutes or so to get the tent completely ready. As a 4-person tent, it's ideal for a small family or group of four enjoying the outdoors in warm weather. It has some good weather protection as well in the event of rain such as a rainfly, waterproof floor, and even inverted, protected seams. Once you're all done, you can simply break it down and place the compact pop-up tent in the accompanying carrying bag to take to the next campsite. Camping should be a time of enjoyment and creating memories with friends and family. It shouldn't be spent on agonizing over pitching a tent. So, to do away with some stress, we came up with five of the best pop-up tents for an easy camping experience. We took into consideration the features of each product on our list, and we even discussed their important advantages and some disadvantages to keep in mind. Prior to getting into our recommendations, we created a buying guide to help you learn more about the product at hand so that you can better choose the best self erecting tent to make your camping experience easier. 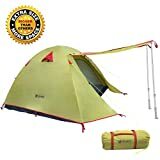 In order to choose the best pop-up tent for camping, it helps to know the aspects and features of these types of tents in general. Below, you'll learn about how size plays a factor, the importance of the type of materials, the shape of the pop-up camping tent, and more. Size – How Much Room is Needed? Pop-up camping tents come in a handful of different sizes. The easiest and quickest way to determine which size you need is deciding just how much room you'll need. Are you camping with only one other person or a few people? Another concern to focus on is how many adults, teenagers, or children will use the tent. There are plenty of small pop-up tents that can fit one or two people, an ideal size if you're camping alone. If there will be three or four people, perhaps consider an instant pop-up tent that fits four. However, if you want everyone to have some extra space, you can purchase a tent meant to contain a couple more people than you have. This way, everyone can stretch out without accidentally getting in each other's way. Most tents are made using nylon or polyester material. They're low-cost and low-maintenance as they hold up against mildew well considering they dry fast. 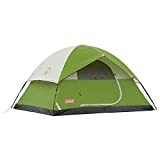 In addition to that, those man-made materials are lightweight, which is a big selling point with backpacking popup tents that are meant to be easy to carry. More so, some are even given a UV coating to protect it from the sun. Some tents are made with other materials such as canvas. This tends to be stronger than nylon and polyester, and they are more durable. They are heavier though, so many easy up camping tents aren't used with that material as to not risk weighing it down. Dome-style may be the most popular choice for quick setup tents. It's a style that's naturally easy to set up and take down. When breaking down, they can get compact enough to make traveling simpler. Also, they're lightweight so you're not weighed down with carrying it around. This type of pop-up tent works best with six or fewer people. The bigger a dome tent gets, the less likely for it to be stable considering its design. You'll more than likely find beach tents in this design. For beach use, the quick tent has incredible UV protection and is made with built-in or removable floors. The best explanation for these tents is that they're an updated form of dome tents. Typically, they have more poles than the dome-style to create a more stable design. Because of their design, they're not the best for large groups of six or more. However, they do offer a good amount of headroom. For weather purposes, they remain upright in windy conditions with ease. Backpacking pop-up tents usually feature this type of design. They're meant to be lightweight and able to hold their own against the outside elements. Though cabin-style is bigger to accommodate more people, there are still a number of pop-up tents in this style. They're not as easy to pitch as dome-style considering their size, but they're spacious enough for several people while still being inexpensive. Tents can get a bit humid inside, especially if you're camping in warmer weather. That is why ventilation is such an important factor to think about before you make any purchase. Search for features such as windows and ground vents. These enhance airflow so that you're comfortable when it's hot. If you also want insect protection while still having good ventilation, search for pop-up tents with mesh designs. These keep bugs away and remain breathable. You don't want a little (or a lot) of rain and wind to ruin an otherwise perfect camping trip, right? Then it may be useful to examine just how weatherproof your pop-up tent of choice is. Does it have features such as protected seams (inverted or heated) so that water can't enter needle holes? Is the floor inside waterproof as well as the cover outside? Be sure to also check with the zippers. Can they be protected and covered by waterproof fabric? These traits can allow you to use your pop-up tent in various conditions and for a much longer time. In addition, some pop-up tents even have a rainfly for added protection. When it comes to wind, search for sturdy poles made from the likes of reinforced aluminum that can withstand it. Traditional tents can be time-consuming and frustrating to set up and take down if you're unfamiliar with it. One of the primary focus of pop-up tents is to attempt to eliminate that difficulty. Many are designed with the ability to pitch in a few minutes or less. A lot of this has to do with the tent and materials all being light in weight enough for just one person to handle. Coleman Sundome 4-Person Tent is designed with families in mind. You can fit a pair of twin mattresses inside or even a queen-sized air mattress instead. With a dome-style design, it provides good headroom, up to 4'11". There's also some space for small items thanks to mesh storage pockets on the tent's walls. If you need some electricity while camping and you have an extension cord, you can run it through the tent without it being a tripping hazard by using the E-Port. As a pop-up tent, it's remarkably easy and quick to set this up with another person or even alone. The poles run continuously and are snag-free. This doesn't offer any insulation for cold weather, but in warmer temperatures, it provides much-needed ventilation. There are large windows with a mesh screen, and to further aid circulation, there's a floor vent. To protect you from the weather, it has a rainfly so water can get through the windows. Beyond that, the pop-up tent uses patented welded floors and protected seams to prevent leakage. 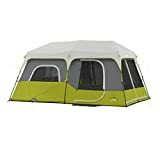 The Coleman Sundome 4-Person Tent offers a fast setup and breakdown process while providing waterproof protection and ventilation for warm weather family camping. WEANAS Professional Backpacking Tent has what you need to enhance your hiking and camping experience. You can choose from three sizes: 1-2-person, 2-3-person, and 3-4-person. This way, you can purchase a tent that will accommodate your needs best. For use in various environments, the pop-up backpacking tent is weatherproof. It features over 4000mm waterproof index, and it holds up against wind thanks to reinforced aluminum poles. The fabric is made from breathable nylon that's UV coated. It still provides average insulation for good use in slightly chilly weather, but nothing too cold. This pop-up tent aims to provide you with more convenience. For starters, there's the light hook design to easily hang a camping lantern. There are also two interior mesh pockets, two-way zipper, and two doors. If you are traveling with trekking poles, the rainfly can double as an awning that you can stick up with your trekking poles. The WEANAS Professional Backpacking Tent features dual doors, two vestibules, and plenty of accessories inside such as mesh pockets to offer you quick convenience as your backpack. Pacific Breeze Easy Setup Beach Tent Deluxe XL is the enjoyed pop-up beach tent for beachgoers. It's lightweight and compact enough that it takes no effort to unpack and set it up. You can even break it down in a few minutes all by yourself. This isn't the best tent when it's windy, but it does include five sand pockets to try to weigh it down. To add more ventilation to the open design, the pop-up tent is made from a breathable polyester material that also includes water-repellant capabilities. Its frame is made from durable fiberglass that adds to its overall lightweight factor. This is capable of fitting up to four people, which can be perfect for a family enjoying the nice weather on the beach. Also, it has an extendable floor that expands its already spacious design. Making things easier for your beach camping enjoyment, this tent has internal pockets so that you can store small items away. You can also utilize the hooks inside to hang various items such as lanterns if you're out at night. The Pacific Breeze Easy Setup Beach Tent Deluxe XL is one of the fastest pop-up tents to set up if you're hitting the beach, and it includes weatherproof fabrics along with an extended floor for additional room. NTK Cherokee GT 9.8x9.8ft Family Camping Tent can comfortably fit five people. Its center height is just less than 6ft. In spite of its size, it doesn't take long or much effort to assemble this pop-up family tent. The ping-and-ring system helps with the fast setup. When it's time to break it all down, the tent packs away easily enough in the included carrying bag. This is not the tent you wish to take in cold weather. Rather, it works best in warmer or hot weather. There's a polyester mosquito mesh that keeps the bugs away while providing you with fresh air. It's thin as well to improve overall circulation. If you're looking for reliable material, this may give you what you want thanks to using Nano-Flex technology to interconnect the tent poles. It's all made from galvanized steel to stabilize the frame. There's even quality in the floor design. The fabric's not only waterproof, but the floor also includes an anti-fungus layer to keep you dry and protected. The NTK Cherokee Family Camping Tent features great protection against the rain while offering large enough space and ventilation for a family on a warm night. If you seek a pop-up tent for the entire family that still has a swift setup process, the CORE 9-Person Instant Cabin Tent is a good option. It can fit two queen air mattresses with no difficulty, so there's no concern about running out of space. For instant setup, the telescoping poles are pre-attached so you only need to follow some basic steps to pitch the tent. To readily access this pop-up tent, it has a large door. This also provides ventilation along with the windows and adjustable ground vents. The ground vent helps hot air escape through the mesh on the ceiling. Of course, having something that's protected in the weather is useful as well. It may perform poorly on chilly nights due to the great amount of circulation it offers. However, it has heat sealed seams on top of the rainfly that zips down to the ground. This keeps water out and keeps you cool and dry on hot, rainy days. The CORE 9-Person Instant Cabin Tent is an optimal family camping pop-up tent that provides tremendous air circulation for humid days while having a sturdy frame to withstand rain and wind.